Since the dawn of the Internet, people have been talking about the death of the established media – be it radio, television or the printed press. They have been wrong so far, but things seem to be changing – and the Internet is asserting itself as a real, competitive arena. We are seeing a shift toward greater complexity in how we consume entertainment and information. The term for what is taking place is convergence – and this time it’s for real. It didn’t take long for tech pundits and culture to start making bold statements: When the Net started becoming a mainstream phenomenon in the mid-nineties, we were told to expect sweeping changes in every part of the media world. The buzzword was convergence, but, as is often (or always) the case, things tend to happen a lot slower than we think. Convergence is originally a very precise term, explained in Wikipedia: “to approach a definite value, as time goes on; or approaching a definite point, or a common view or opinion, or a fixed state of affairs.” It is used in mathematics, biology, and other natural sciences. Form this it has been adapted to describe social phenomena – when we speak of cultural and technological convergence today, we talk about how different media are adapting to perform similar tasks, or fill similar roles. The obvious example is how you can consume your local newspaper in print as well as online, but that was only the wee beginning. Now everything is happening at once. Because broadband access has become a mainstream commodity, content that has traditionally been too bandwidth-demanding is exploding onto the web – and IP distribution is now a viable alternative to the cable-satellite combo we are used to. Now access providers, distributors and media companies are scrambling to find the right business models and technological platforms. While many of these services have been around for a while, now you can download or stream complete movies to your PC, watch music videos, play premium PC games, listen to web radio, or download music. The content industry is responding to consumer wishes and behaviour, but slowly, like a giant snail. In the wake of peer-to peer distribution, record labels and movie studioes have been scared out of their collective wits. Broadband access mad it possible to distribute large movie and music files through file sharing networks, making executives worry about dropping sales and losing their jobs. This has meant that other enterprising actors – such as Apple, who have become market leaders with the download service iTunes – have taken the field. The movie and music industries have been understandably concerned with protecting established markets, but have not understood the role of file sharing, which is a powerful marketing tool much more than a revenue-sucking pirate arena. The corporate sector is also getting into the convergence game. One of the fastest growing trends in the information-hungry finance world is webcasting. Press conferences, financial reports, forecasts and all kinds of information is being transmitted via the Internet, with huge advantages for analysts, journalists, and investors. In a market where timing means everything, the time saved by not having to travel to a company’s press conference is worth millions. An important development, which is kicking in as we speak, is the proliferation of wireless communications. Wi-fi hotspots are popping up all over, and the UMTS, or 3G, mobile network is promising high speed transmission to cell phones everywhere. This has already started – in Japan it is already a big source of revenue – and it is gaining ground as customers get new 3G-enabled handsets. In Norway, the telcos have been cautious about rolling out the new network, but the license terms state that every little hamlet with more than 200 inhabitants must have UMTS coverage by March 2007. Wireless is a complicated issue for hardware makers and content providers, because there are so many competing standards being developed at the same time. PCs are currently being shipped with ADSL-based 802.11b- and 802.11g –enabled equipment – what we call WiFi – but there are many other standards trying to claim supremacy. Many consider UMTS a likely candidate, since it will mean that mobile phones and computers can share a common transmission system. On the other hand, heavy hitters such as Intel and Fujitsu Siemens are backing WiMAX, which has the great advantage of being completely wireless, meaning that you don’t need a physical ADSL connection to be able to hook up. Right now, WiMAx is the biggest, most talked about phenomenon in the telecommunications industry. The projected launch is in the second quarter of 2005. Convergence manifests itself in myriad ways. IP telephony is a cheaper, Internet-based version of your regular home phone. WebTV is television broadcast over the Internet to your PC, while IPTV is television streamed through a set-top box to your TV. There is a huge growth in multimedia PCs designed for the living room – sleek silver or black boxes designed for media distribution, often combined with DVD players, wireless routers, or other equipment. The idea is to make one single box for your living room that can do everything: Regular television, DVD playback, recording to DVD or hard drive, play MP3s, play streaming movies from the Internet, and so forth. Preferrably without wires. 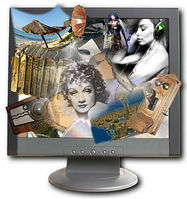 Computer screens and flat screen LCD TVs are becoming more and more alike, and many computers come with TV-cards essentially turning your laptop into a television set. At the same time, big cable operators are offering broadband connections bundled with TV packages – and if you add telephony, you get what is called Triple Play – a complete communications package, with access and content, from the same provider. This makes for a very confusing situation for consumers. Back in the old days you only had to choose between Betamax and VHS. Now there are so many possibilities that users have to be very informed in order to make a good decision. Right now, the battle stands between two platforms: The PC, and the combination of a set-top box (essentially a stripped-down computer) and a TV, is mainly simplicity and ease of use versus possibilities and functionality. 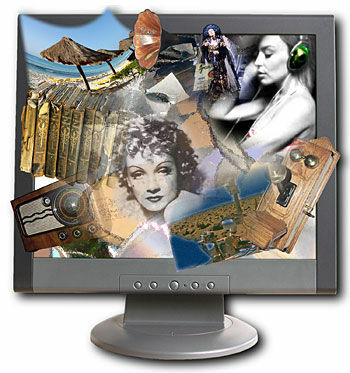 Multimedia PCs have a simpler user interface than your conventional PC – commonly controlled via a remote control. This give as lot fewer options than keyboard inputs, but when you are consuming entertainment in the living room, you don’t really need to type a lot. On the other hand, since multimedia PCs are subject to many of the same dangers, bugs, and network problems as other PCs, troubleshooting can be difficult without a keyboard. To address this problem, companies like Fujitsu Siemens and Sony are enhancing their PCs to enable multimedia consumption, while keeping the keyboard and standard functionality. Some PCs are being shipped with both remote control and keyboard. For example, Microsoft Windows XP multimedia edition is a version of XP that is specially designed for multimedia use – you use the keyboard for normal computer activities, and the remote for movies, music and TV. The good news is that everything is happening so fast that you should be able to get good off-the-shelf wireless multimedia products within the year. Expect the usual early bugs, but be prepared to change the way you think about entertainment. When the music, gaming, and movie industries get their online business models sorted out, you may never have to leave the couch again.